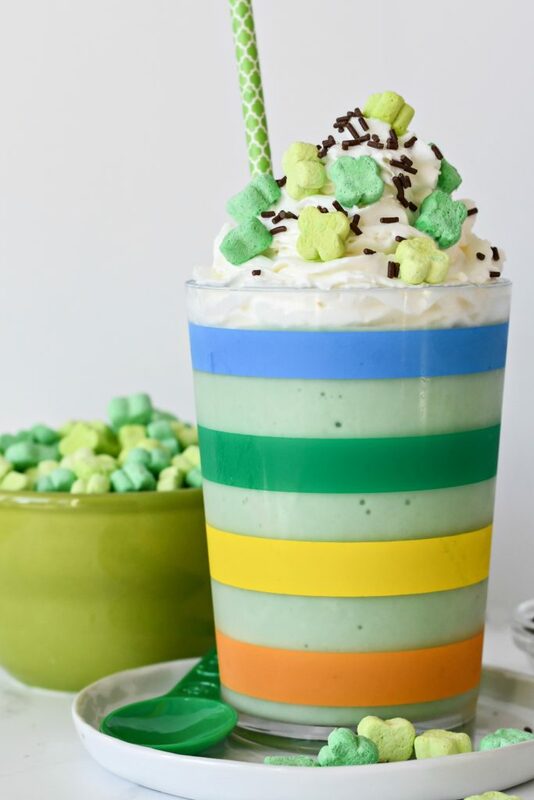 Free from food dye, dairy, and sugar, this Shamrock Shake is a healthier indulgent treat you can feel good about feeding your family this St. Patrick’s Day. older, but a green, minty shake sounds like the bomb, right? It still CAN be, minus the extra chemicals and junk. This only has 5 ingredients, contains zero sketchy stuff, and is delicious for you and your little ones to enjoy! You won’t even find food coloring in this – that green color is from MATCHA! If you haven’t heard, matcha powder has been having a moment- it’s everywhere, and for good reason. It’s packed with antioxidants, fiber, and vitamins. Matcha powder has also been noted to have a positive impact on a child’s oral and heart health. A Shamrock Shake that’s good for you, your kids, and tastes great! Lucky you! Put the frozen bananas and coconut cream in a high speed blender. Blend on low until combined and an ice cream consistency is formed (this may take a few times of turning the blender off and scraping down the sides with a spoon). Add the remaining ingredients and blend until everything is incorporated. Please note that in order to maintain a shake-like consistency, avoid over-blending. Pour into a glass and top with dairy free whipped cream, Lucky Charms marshmallows, sprinkles or whatever you want! Enjoy immediately. Hilaire is the blogger behind the site Baumass Foods, where she makes and eats plant-based foods that are the bomb. When she is not in the kitchen or drinking kombucha, she can be found in the gym or chasing after her son. Follow Hilaire on Instagram, Facebook, Pinterest, and Twitter!